How SaleCycle helped Cath Kidston increase online sales and improve their customer experience online. The average cart abandonment rate is currently more than 75%. 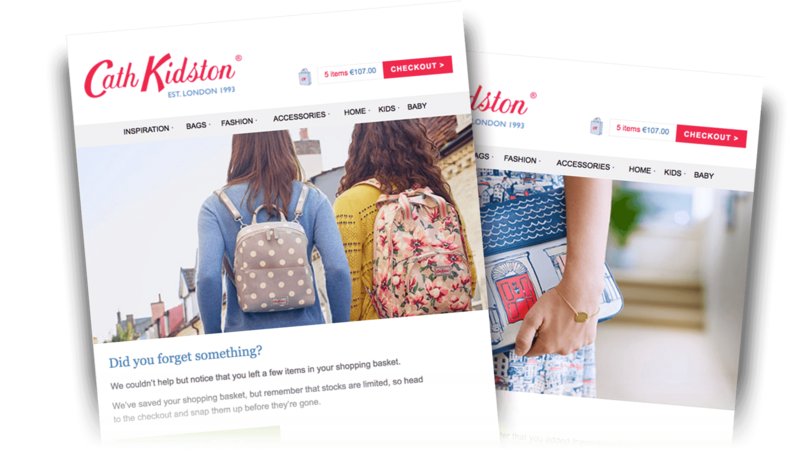 Cath Kidston approached SaleCycle to create an Email Remarketing program to help convert more of their web visitors into customers. By sending the email through email service provider eCircle, two hours after a cart has been abandoned, customers are engaged at a key part of the buying life cycle, whilst the subject line ‘A little reminder from Cath Kidston’ gives the email an engaging but soft tone that customers respond to. The creative is a fine example of what a cart abandonment email should contain:, full basket contents, strong brand emphasis and a clear call to action button. Cath Kidston’s campaign has been a huge success, and is the company’s most effective email with more than half of recipients opening the email, and a click through rate of 14%. Abandoners also tend to spend significantly more, with the average order value of purchases direct from abandoned cart emails 65% higher than that from Cath Kidston’s direct sales. Customers are fiercely loyal to our brand, and ensuring a great customer experience is vital to us. Working with SaleCycle we send beautiful, elegantly branded emails to our customers when they abandon a basket, increasing our sales and improving the customer experience. SaleCycle are always very helpful with any questions we have and are very easy to work with. A great partnership. Second Cycle Email	If at first you don't succeed.